We are set in a quite lane just ten minutes from the well known market and beach .Palacete Rodrigues Holiday Home is an ideally placed holiday retreat. We have 3 Suites, 11 double rooms and 1 single bedroom with en suite bathrooms. 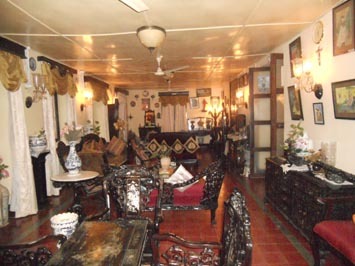 The bedrooms are beautifully furnished with carved furniture which retains the charm of this grand mansion. 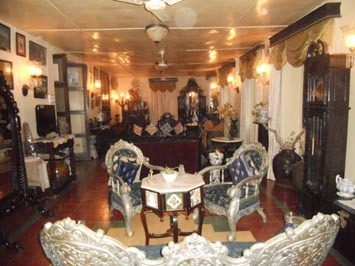 Its old world decor takes one back to the days of peaceful colonial rule. Nearest Airport (Dhabolim) is approximately around 50 KM and the Railway Station (Tivim) is around 19 KM.Other famous beaches of Goa such as Calangute Beach, Baga Beach, Vagator Beach, are within 5 KM of Palacete Rodrigues Holiday Home. Leading from the enterance hall is the LOUNGE. The photograph displays the grandeur. The Garden place is very spacious with beatiful swimming pool. 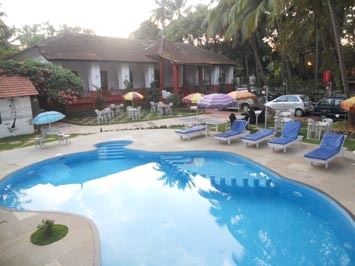 Its greenery, peace and tranquility along with the surrounding area add glamour to a peaceful stay. The polished furniture dates back to bygone years. Lay back and appreciate its craftsmanship and beauty!